Your godson’s birthday is probably one of the most important occasions in your life. It’s a moment to make him feel the love and happiness this memorable day comes with. It’s a time to cheer him up with some lovely messages and let him know how much you value his presence in your life. This is a fine collection of original birthday wishes you can send to your godson to make his day as wonderful as he is to you. 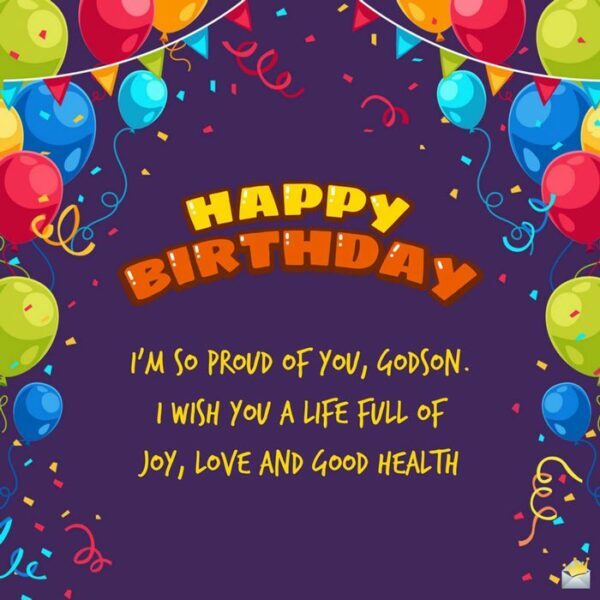 Dear Godson, on this momentous day of yours, I just want to let you know that my heart shall always love and cherish you because you bring so much sunshine into my life. Happy birthday. You are a sweet Godson who always turns my bad days into good ones with your smiles. I hope you forever remain as sweet as you are. May God bless you so much, my dear. Happy birthday. Happy birthday! It’s been wonderful having a Godson like you in my life. I pray that God will continue to bless your kind heart and cause you to increase in all aspects of your life. I bless the day you came into my life. In my eyes, a loving and caring Godson like you is worth more than all the riches of this universe. I hope this new age of yours is filled with joy and happiness. Have a blissful day, my dear. 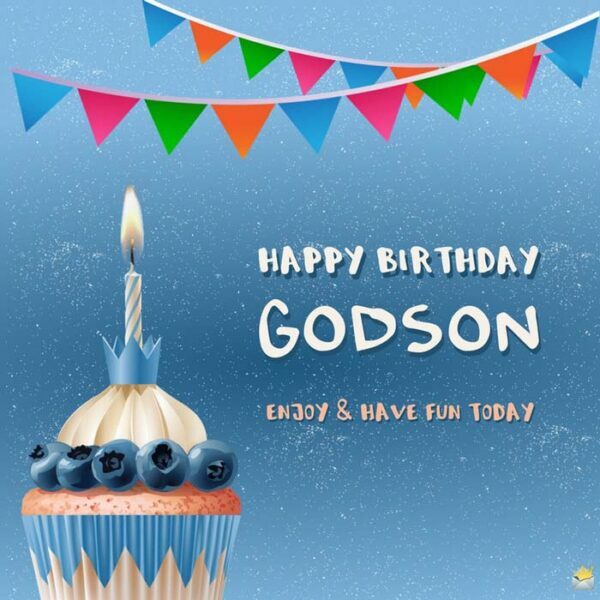 Happy birthday, dear Godson. No amount of words can describe how much you mean to me. I am so proud of you, my dear. Wishing a brilliantly fabulous birthday to my wonderful Godson. You have really grown up to be an extraordinary person. As you turn a new age today, I pray that your life will forever be filled with felicity. Happy Birthday, godson. Enjoy and have fun today. Still searching for the right words to show how delighted I am to celebrate another birthday with you, Godson. Give me a moment please. 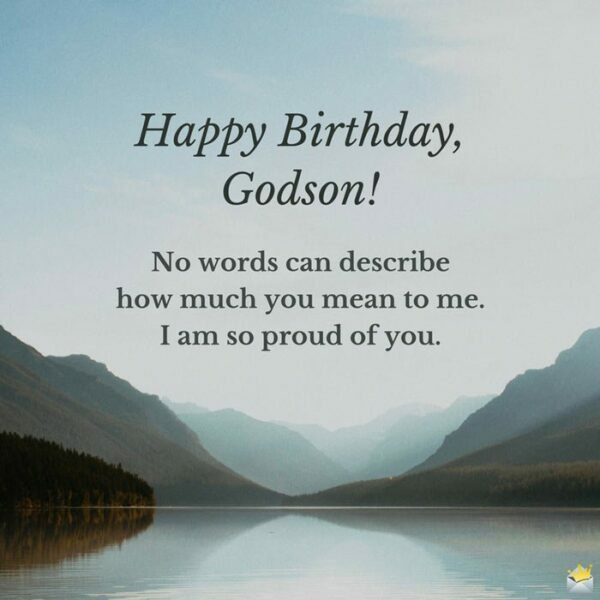 A happy birthday to you, Godson. You continually amaze me with your accomplishments. Are you sure you are not older than this age? You are as important to me as the search engine Google is important to a person making research online. Happy birthday. Like a brutal lung disease, you constantly take my breath away! Happy birthday, Godson. Yay! I remembered my Godson’s birthday without the aid of a Facebook birthday reminder notification! Ain’t I an awesome Godfather/Godmother?! Congratulations on turning 16. May your life be filled with hope, love, and everything that is dear to your heart. 16 is a once in a lifetime age. I hope you enjoy to the fullest every moment of this phenomenal age. Happy birthday, my dear. Happy birthday to my handsome Godson who just turned 16 today. My wish for you on this great day is that every blessed day of the rest of your amazing life will be filled with total happiness. May your 16th birthday be one of the most memorable and wonderful days of your life. I love you so much. Happy birthday. I wish you a life filled with delight, euphoria and good health. Happy 16th birthday! This is just the beginning of wonderful moments in your life. As we commemorate your 16th birthday, I send your way much love and many good thoughts. Happy birthday, Godson. Have a superb 16th birthday celebration! On this day, I wish your life is surrounded with happiness, joy, and true love. You are truly a wonderful blessing in my life. My precious Godson, today is no ordinary day since it marks your 16th birthday. May your heart overflow with peace, love and bliss all the days of your life. I love you. Happy Birthday, Godson! No words can describe how much you mean to me. I’m so proud of you. As you celebrate your 18th birthday, it’s my hope that you focus on accomplishing your dreams and being happy in life. May the sky be your spring board to success. Have a blast, Godson. Happy birthday to a Godson who has grown to be one of the most remarkable young men I’ve ever known. Turning 18 is a life-changing experience. Take the journey slowly and enjoy every moment of adulthood. Welcome to the adult world, dear Godson! I hope that all the days of your life are as awesome and sweet as you are. May your special day be loaded with nothing but fun and memorable moments. On your 18th birthday, I pray God will make your life happy and your future as bright as a million diamonds. I wish you the very best in life, my precious Godson. I raise a toast to my beloved Godson who turns 18 today. I hope this day grants you all the desires of your heart. May you live to have lovely and unique moments. Happy birthday. Your determination in life and sense of maturity is highly commendable. As you celebrate this special day, I wish you grow to be an inspiration to everyone around you. I hope you have an excellent 18th birthday. Yay! My adorable Godson just turned 21. My dear, you make me so proud to have the honor of being called your godfather/godmother. You are truly my shining star. Happy birthday. I wish you all the best on your 21st birthday. May this special day mark the beginning of great things in your life. Happy birthday. My cherished Godson, on this day, I want you to know that I love you so much and will never let you walk alone. I will always be there for you as a friend and as your pillar of support. Happy 21st birthday. Happy Birthday. I’m so proud of you, godson. I wish you a life full of joy, love and good health. You have grown into a fine young man, and I’m so proud of you. May God never stop showering His blessings on your bright loving soul. Happy 21st birthday, dear. I remember how when you were a kid you used to talk endlessly about your dreams. Now is the time to chase those dreams and see them materialize. Happy 21st birthday! You have just turned 21, but in my eyes, you’ll always be my adorable little bunny. I wish you love, joy, peace, health, prosperity and all the things you need to enjoy a good life. Cheers! Wishing my dearest Godson who turns 21 today a very joyful and memorable day. I may not always have the opportunity to see you, but always remember that you are forever in my heart. I love you. Happy birthday to my loving and caring Godson who turns 21 today! Son, may you live an extremely exciting and healthy life. I have loved you ever since I set my eyes on you, and I will love you until the end of time.